The Ladybug Letter is an open letter from Mariquita Farm to everyone with a curiosity about the people, practices, and politics of farming. We send it out every few (several) weeks when we have an article we think you all would love. 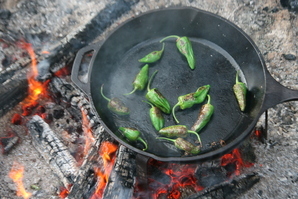 We do continue to send a weekly newsletter every week year round with many recipes, notes about our events, CSA, notes from Andy (and often a full article from him), upick dates and messages, and more. Sign up for our Ladybug Postcard weekly email here. More about our frequent produce deliveries of bulk produce throughout the bay area at the bottom of this message. 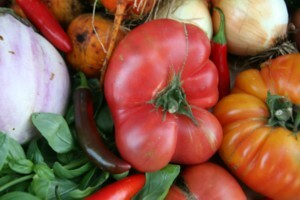 Tomatoes, Strawberries, Padron Peppers, Melons, and more! Fields next to church in Falling, Denmark.Traditionally Rogation Days were celebrated in the Lutheran Church in the spring following Easter. Have you ever seen or heard of Catholic priests going down to the harbor to bless the fishing fleet? Well, in the Lutheran Church the Days of Rogation are understood as a time to bless the fields. The word “Rogation” comes from the Latin rogare, meaning “to ask” and the people asked for the land and for their work on the land to be blessed. In the old days people were a lot closer to earth than many of us are now. Agricultural fields and pastures crowded up to the church walls. The people worshiping in the churches came from the fields and a pastor would encounter no difficulty in leading the congregation out of the church back into the fields for a ceremonial procession. A couple of Sundays ago Julia and I were invited by Michael, a Mariquita Farm CSA member and a member of Christ the Good Shepherd Lutheran Church, to come to his church and participate in their Days of Rogation service. Michael’s invitation wasn’t entirely out of the blue. Christ the Good Shepherd Lutheran Church on Meridian Avenue in San Jose is one of our CSA vegetable box pick-up sites, and it has been for years. This week we start the third quarter of our seasonal harvest box deliveries and I want to thank everyone who has signed up to receive our farm’s produce again. I want especially to thank all of the pick-up site hosts who generously allow us to use their homes, their businesses, and their places of worship as distribution points. Without their patience and generosity of spirit Community Supported Agriculture programs like ours would be next to impossible to manage, and our farm would be history. I look at every pick-up site we service as a blessing. But beyond that, I’m a farmer, an employer, a manager of land, and I’ve got teenagers, so I can always use an extra blessing or two. Julia didn’t go with me to the Rogation service. Her mother, Fran, had taken both Julia and our daughter, Lena, to visit friends in Denmark, where my great-grandparents immigrated from over a hundred years ago. When I was in the Lutheran Church in San Jose Julia was visiting the ancient Lutheran Church in Falling where she found my great-great grandfather, Rasmus Jorgensen’s gravestone in the churchyard. The Jorgensens were farmers. Most people were farmers back then, I suppose, except for the people in the castle, and Falling has a big castle. My great grandfather, Marius, could have been in a Rogation procession that led out of the church in Falling and into the fields. Denmark was a poor country back then. The farms were little and the families were big. For Marius, coming to America was a blessing. Pastor Bea, from Christ the Good Shepherd, emailed me a couple of days before the service. Meridian Avenue in San Jose is a long way from the fields these days, she pointed out. And Americans aren’t super traditional, so she had the idea that we could try to bring a little bit of the farm to the sanctuary; a bowl of soil, to be precise, and she would bless that, along with other bowls and sacks of soil from the backyard gardens of the people in the congregation. And people don’t necessarily know a lot about what goes on farms anymore, she wrote so would it be ok if I talked with her for a bit in front of the congregation during the service. “And who is working at Mariquita Farm?” she asked. “Besides my family, and the twenty families of my employees who depend on our farm for their livelihood, Mariquita Farm sends weekly boxes of produce to 600 families from Gilroy and Corralitos up to San Francisco,” I answered. There’s no harm in asking, I guess. They don’t call it a Day of Rogation for nothing. Copyright 2011 Article by Andy Griffin. Photos taken in Falling, Denmark by Julia Wiley. Ladybug Truck Farm Deliveries We continue to visit San Francisco, Palo Alto, Santa Cruz, Menlo Park, Los Gatos, San Jose and more. Recently we’ve been selling the following things: melons, strawberries, padron peppers, genovese basil, olive oil from Belle Farms, and mystery boxes. What’s great about these deliveries for some families is that you just order when you want, what you want. On vacation? Not cooking? just ignore my little ‘reminder’ emails. The mystery boxes aren’t a CSA box, because you don’t pay ahead. You order one when you want, and show up and pay us and take your box. We also have our traditional CSA that over 600 people love: There are many pick up sites and many home cooks like getting fresh veggies each week at the same location. The tomatoes are just about here. It’s amazing how quickly the trickle of Andy bringing the precious first fruit for a simple salad in our kitchen turns into an avalanche! We will have several Saturday Tomato upick events, with a couple of weekdays too. Please do sign up for the ladybug postcard weekly email and or our Facebook page to get the latest news on when the upicks will be. Andy likes to schedule them once he sees the abundance of fruit. The San Marzanos and Heirlooms are looking gorgeous this year!